Though news coverage of gun violence, war and terrorism amplify anxieties that human society is becoming more violent, a forthcoming Nova documentary looks at many different ways in which science and history show the opposite is true. Drawing from the best-selling book by author Steven Pinker, Angels vs. Demons takes viewers on a journey through the world’s violent past, looking through lenses of history, social science, biology and neuroscience, to investigate whether violence is on the decline. The two-hour film is scheduled to air in November 2019. Pinker’s book, The Better Angels of Our Nature: Why Violence Has Declined, has “this shocking premise that we’re living in the most peaceful time in human history,” said Julia Cort, deputy EP of Nova. “If this has really happened, and violence has declined over the centuries, why?” Cort asked. The documentary may leave viewers feeling optimistic because it shows that reducing violence is a problem that can be addressed, said Michael Bicks, producer, director and writer. “And then you just hope that we will,” he said. The films explores how violence, empathy and reason have influenced human behavior over time and asks how our “angels and demons” have been baked into our biology from the beginning. 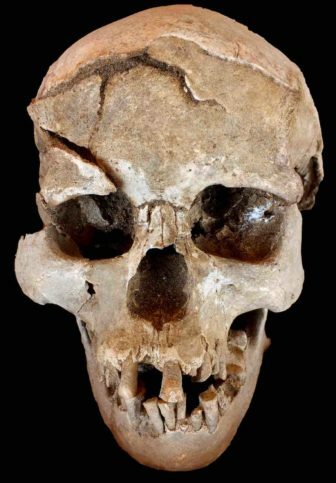 The skull of a man, about 10,000 years old, unearthed 30 kilometers west of Lake Turkana, Kenya. The skull has multiple lesions consistent with wounds from a blunt implement. For example, during field production with archeologist Marta Lahr, Nova’s team learned that violent behavior was more prevalent in prehistoric societies than they expected, Bicks said. While excavating a site of early human warfare at Nataruk in Turkana, Kenya, Lahr discovered arrowheads and other weapons that had been made from raw materials from 100 miles away. There were signs of violent death, such as a skull with an arrowhead in it, Bicks said. But Nataruk wasn’t an isolated discovery. There are plenty of other archeological sites where a large proportion of prehistoric human remains bear signs of violent warfare, Cort said. Violence is something that humans inherently enjoy, said Anna Lee Strachan, producer, director and writer. The documentary explores this by taking viewers into a neuroscience lab where researchers have shown that revenge is sweet to the brain and stimulates the same area that’s excited by chocolate. And despite how violent acts of revenge can light up our neurotransmitters, homicide numbers have been declining over centuries. “One of the things that we found very surprising is that something as simple as manners, like using a knife and fork, seemed to have led to the reduction of violence,” Bicks said. Practicing good manners taught people how to control their impulses. As manners became more common, they may have influenced a decline in murder rates, Bicks said. The last chapter of the film will focus on modern-day efforts to reduce violence, such as programs that treat it like an infectious disease. “If you attack it like you would a disease or a virus that you try to contain, you actually can reduce it and stop it from spreading,” Cort said. The film looks at Gary Slutkin’s work with Cure Violence, the Chicago nonprofit featured in the 2011 Frontline documentary The Interrupters. Using disease control strategies, the organization detects and interrupts conflicts. Its methods have reduced violence in Chicago and in cities across the U.S. and world, Strachan said. The schedule will feature “high-performing library content and specially commissioned projects,” said Bill Gardner, PBS programming development VP.